Oldest-known dentistry found in 14,000-year-old tooth–More than 10,000 years before the Pyramids of Egypt. “It predates any undisputed evidence of dental and cranial surgery, currently represented by dental drillings and cranial trephinations dating back to the Mesolithic-Neolithic period, about 9,000-7,000 years ago,” says Benazzi. The find was directly dated between 13,820 and 14,160 years old. It’s now kept at the University of Ferrara for further studies. “The treatment went unnoticed for all these years. The cavity was described as a simple carious lesion,” says Benazzi. “They were the result of a variety of gestures and movements associated with slicing a microlithic point in different directions,” says Benazzi. “Basically, the infected tissue was picked away from inside the tooth carefully using a small, sharp stone tool,” says Benazzi. 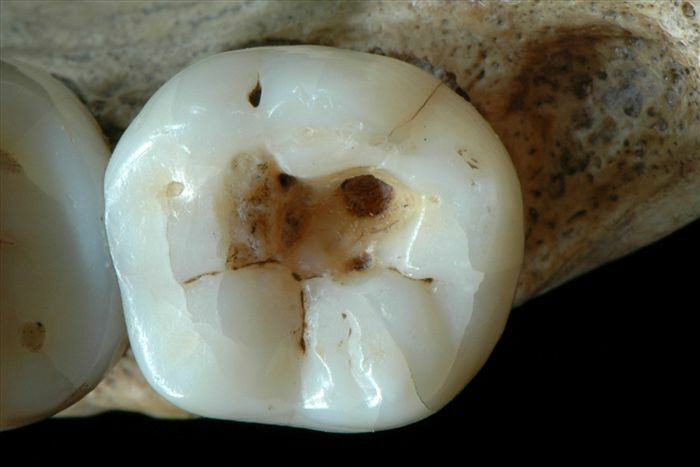 “This shows that Late Upper Paleolithic humans were aware about the deleterious effects of caries, and the need to intervene with an invasive treatment to clean a deep dental cavity,” he adds. “It shows that humans combined dexterity and creative skills and properly managed technology for producing tools also in early dental medicine well before the Neolithic, ” says Peresani.